All inclusive, covers p er person workshop registration, double-occupancy lodging & meals from dinner on arrival to breakfast on departure. Room with Private Bath $1,355; with Shared Bath, $1115, with Communal Bath, $1,025, Commuter $678; Camping rates also available. 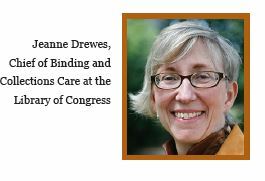 This class, taught by Jeanne Drewes who is Chief of Binding and Collections at the Library of Congress, provides library staff and all book-lovers a better understanding about the destructive elements to paper-based materials and the hands-on experience to repair them. Techniques include page mends, hinge tightening, spine replacement, corner repair, and book text reattachment through sewing and/or gluing. Caring for library and private collections is a challenge at any time, but particularly difficult when resources are limited. With care and technique, book and magazine life can be extended. Become a book doctor and make your library and archive materials “fit for purpose.” The class is particularly useful to librarians but all book-lovers wishing to learn the techniques for becoming a book doctor are very welcome. Participants may bring their own books in need of evaluation and repair or work with those at the Ghost Ranch Library. Ghost Ranch, 21,000 acres located in Northern New Mexico, is an ecumenical and interfaith education and retreat center of the Presbyterian Church (USA). For over half a century, people have come here for spiritual development, to discuss issues of peace and justice, to work together in creation care, to paint and write, to hike and to ride horseback, to research rich and globally renowned archaeological and fossil quarries, to see where Georgia O’Keeffe painted, to try something new or to simply rest and renew their spirits. For more information and registration, click here for the workshop flyer.